ABOUT THE BOOK: Eleven-year old Dini loves movies—watching them, reading about them, trying to write her own—especially Bollywood movies. But when her mother tells her some big news, it does not at all jive with the script of her life she has in mind. Her family is moving to India…and, not even to Bombay, which is the center of the Bollywood universe and home to Dini's all-time most favorite star, Dolly. No, Dini is moving to a teeny, tiny village she can't even find on a map. Swapnagiri. This joyful, lively Bollywood inspired story, full of colorful details, delicious confections and the wondrous, magical powers of coincidence, will have you smiling from ear to ear. And now, let's talk with the lovely Ms. Uma. Thanks for visiting the Fire Escape, my friend. 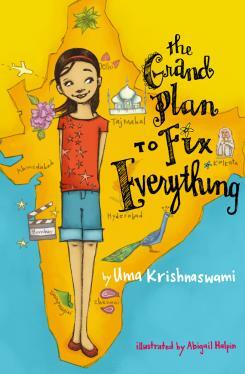 Can you describe the experience of writing a book set in India as an Indian-American? Were you conscious of interpreting India for a non-hyphenated audience? I wasn't overly conscious of trying to interpret India, because I figure my view of anywhere is going to be just that--one view. It's why we need many stories. I did realize that I was picturing a hilly region far from the hot cities, and that some people may find that goes against how they visualize India. Well, if I were to set a story in New Mexico, I imagine there'd be people who might say, "That's in America?" So I figured the best thing to do was to give agency to Dini, my hyphenated character in The Grand Plan to Fix Everything. 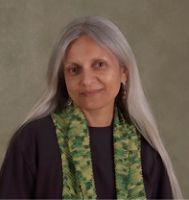 She sees both India and America through her own Bollywood-tinted lenses, so the reader gets to see it that way too. And if it seems a little fractured and crazy--well, that's pretty much how it is. I know we're both fans of author Chimamanda Adichie's talk, The Danger of a Single Story, so I appreciate your thoughtful answer. Okay, moving on to process: what's one big change you made to the book thanks to your editor's suggestion? Not so much a change but a deepening. Most of the plot and the interactions between subplots were already in place. The big editorial work I needed to do was to deepen the storyline of Dini's and Maddie's friendship, and place Dolly as the glue holding that friendship together. Those things were there, but in many places they were beneath the surface. I had to work to bring them more into the spotlight. Could you give us a playlist of your top three Bollywood films for newbies? Thanks! I'm sure Netflix will report a run on these titles now that you're recommending them. Last but not least, I've heard so many great things about your work as a teacher of writing. How does that vocation support and/or conflict with your own writing? It supports it in really wonderful ways. I find that when I'm working on student manuscripts and talking to students about craft, I get a break from thinking directly about my own work, but it's there in the back of my mind. And then when I go back to it, I find I'm fresher, and better able to dig in. In part, it's that forced time away from it, but I think there's more it it than that. Maybe the conversations with students (and with my fellow Vermont College of Fine Arts faculty) allow my subconscious to make the necessary connections with my own work. Sometimes, of course, teaching takes up time, and I have to set my own writing aside to give that time. I'll be taking a semester off this fall for that reason, so I can get caught up on projects I want to complete, as well as some that are already under contract. I'm excited about any new Krishnaswami projects, so I fully support this sabbatical. But I also appreciate your commitment to and example of mentoring and championing other writers. Thank you, Uma, for this beautiful book, and for your consistent excellence in this vocation.